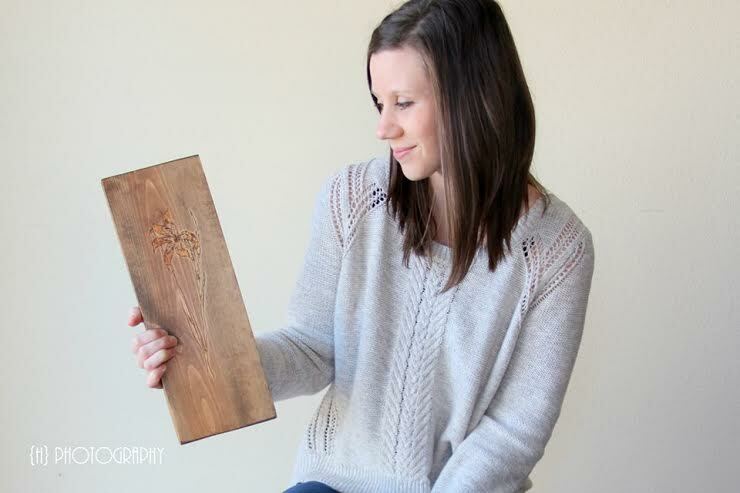 Kelly Meagher is wood burner and stay at home mom living in Northwest Arkansas. 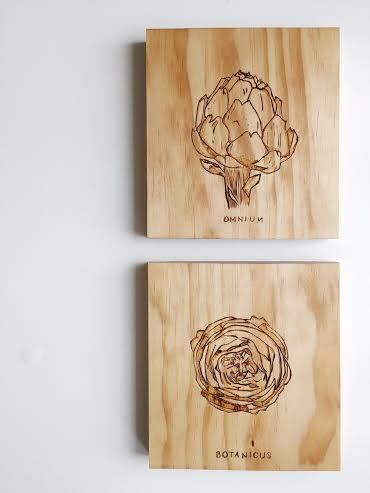 She specializes in botanical wall hangings, and has a unique and interesting story behind her path to woodworking. Meagher grew up in Mexico with parents working in missions working to help support those trying to leave the drug trade. Her father opened a carpentry shop to provide opportunities to those men seeking a better life. “Everything in our home, from the cabinets, to the beds, to the dressers were built by my dad. I remember being fascinated with watching him turn raw slabs of wood into beautiful pieces of furniture. To be able to envision an end piece out of nothing, and then be able to execute it was amazing to me – and beautiful,” says Meagher. 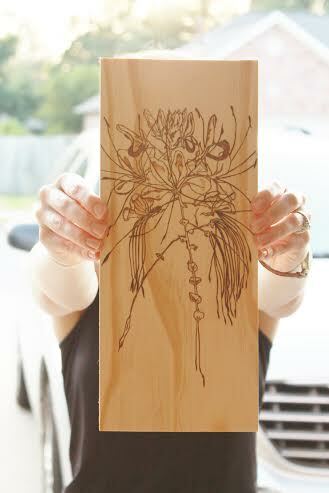 Later on, Meagher stumbled onto the wood burning technique she now focuses on. Eight months pregnant with her son, she wasn’t happy with any of the decorations she found while working to decorate her new home. She decided to play around with her husband’s wood burner, and immediately fell in love with her creations. 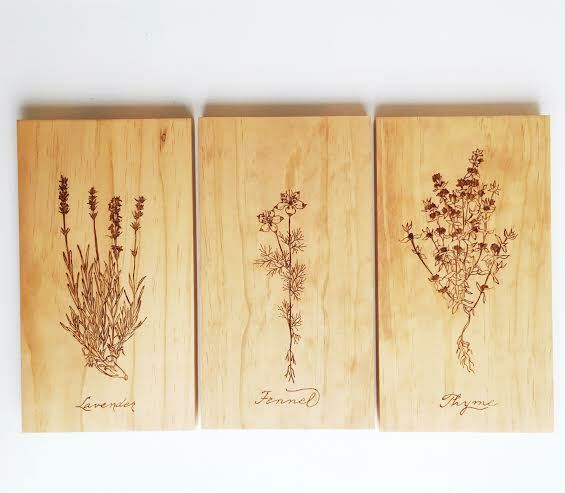 A few months later, Meagher decided to open up her now thriving Etsy shop, Of Thistle and Thyme. As far as considering whether or not her gender has affected her experience in woodworking, Meagher does not think it has since she is stay at home mom and hasn’t ventured to much into the woodworking community. As far as her clients go, Meagher explains “I’ve noticed that about 90 percent of my customers are women – and I intentionally have tried to reach women as my audience on social media – mainly because my shop is home décor and specifically botanical and floral in detail – so more feminine in nature.” But while her clients at mostly women, Meagher shares that males are more likely to reach out to ask questions about her tools or process, even though they may not be the ones actually buying her product. Specifically for those looking to start their business and are considering Etsy as their initial platform, Meagher was kind enough to share details of her experiences to those interested. “I originally started my shop with both its own website as well as a store on Etsy. But after a few months I saw a clear advantage to having an Etsy shop with an already established audience versus trying to generate traffic to my own website. The thing about having a trade of any kind, is that not only are you working at your trade, but if you’re boot strapping it like I have, you’re suddenly a photographer, marketer, business developer, and customer service person. It’s a lot to take on, especially if what you really love to do is just create. I’ve found Etsy to be an awesome answer to a big portion of that pressure. They already have an established audience who are looking for handmade products, and I’ve simply have to tap into it. It’s saved me a lot of leg work. Etsy has provided so many artists and new business owners with the opportunity to explore their passions and turn them into a real job, and a real business. It’s been a pleasure to see someone able to use the platform to develop and grow their craft while simultaneously being able to reach thousands, if not millions of people to help build that foundation. You can check out Meagher’s Etsy store Of Thistle and Thyme, and be sure to connect with her on Instagram at @ofthistleandthyme and also on Facebook at facebook.com/ofthistleandthyme.